After months of coordination, NYC NOWC is proud to announce the launch of its first Worker-Owner Leadership Council. The cohort of five worker-owners, elected by NYC NOWC membership in both in-person and online elections during the month of September, celebrated its onboarding orientation at the office’s of FPWA this past Tuesday, November 1st. The orientation was an opportunity for members of the leadership cohort to become familiar with the sometimes dizzying Worker Cooperative Business Development Initiative (WCBDI) funded by City Council discretionary funds since 2014. Among the goals of the Worker-Owner Leadership Council, is to bring the voices of worker-owners to the funded initiative by providing a space for them to give feedback on programmatic priorities and the types of direct services initiative partners should offer during FY 2018, in preparation for next spring’s public advocacy efforts. Leadership Council members will also serve as representatives of worker-owners in City and State Lobbying efforts. 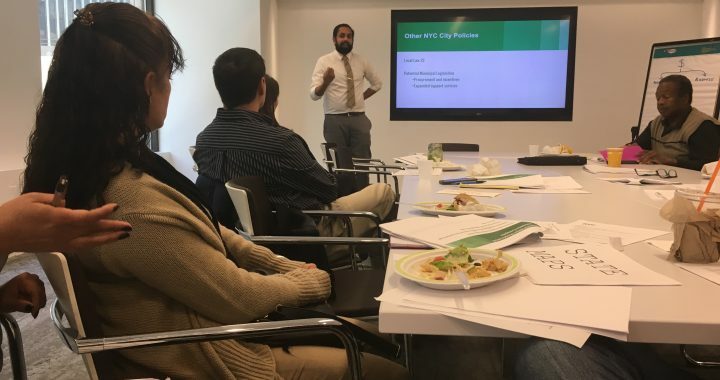 In addition, the Leadership Council will report back to NYC NOWC members at our monthly programming events, keeping them abreast of the latest developments and collecting feedback to bring back to initiative partners and other support organizations. I’m Co-founder and president of Trusty Amigos Dog Walking and Pet Care Cooperative, and a young woman living in America. I’m a proud dog walker, coop member, and Coop president. I am excited about sharing my experience to help more people get out of the “normal” 9-5 routine, and into work opportunities that function well for them. I also want to help people have a better life through fair wages. I want to participate in this Worker Owner Leadership Program to start participating in the coalition, representing Worker-Owners. Not only to represent Worker-Owners but to help increase cooperation between coops, as stated by principle 6. I see this program as a way to start creating more relationships for cooperatives. Relationships in which cooperatives can gain support from organizations. Where these organizations can help cooperatives fulfill the 7th principle “concern for the community”, to help strengthen our community. Soy co-fundadora y presidente de la Cooperativa de cuido de mascotas Trusty Amigo. Para mi es un orgullo ser cuidadora de mascotas, miembro y presidenta de nuestra cooperativa. Estoy muy emocionada de compartir mi experiencia para ayudar a más gente a salir de la rutina 9-5 y en conseguir oportunidades de trabajo que funcionan mejor para ellos. También quiero ayudar a que más personas mejoren sus vidas a través de salarios más justos. Quiero participar en este Programa de Liderazgo, para poder participar en la coalición y representar a trabajadores-propietarios a nivel de la ciudad. Mi ineteres en el programa no es sólo para representar a trabajadores-propietarios, sino para ayudar a aumentar la cooperación entre cooperativas, según el principio 6 de los principio cooperativistas. Tambien, veo este programa como una manera de empezar a crear más relaciones para las cooperativas. Las relaciones en las que las cooperativas puedan obtener el apoyo de organizaciones . Cuando estas organizaciones pueden ayudar a las cooperativas cumplen el séptimo principio de la “preocupación por la comunidad”, para ayudar a fortalecer a nuestra comunidad. Worker-owner of ACTION Health and Safety a nascent cooperative focused on workplace safety and occupational health. As an immigrant from Colombia, I settled in New York several years ago, where I joined the community organization Make the Road NY. At MRNY I joined the immigration committee and became a leader within it, which played a prominent role in the campaign for the NYID for city residents. I also have been a volunteer member in other organizations like ACQC, working on HIV prevention in the Latino Comunity. Now as an authorized OSHA trainer I promote the importance of having a safe and secure workplace. C0-dueño de ACTION Health and Safety una naciente cooperativa que trabaja por la seguridad y salud ocupacional. Como colombiano inmigrante, se radicó en Nueva York, donde se integro a la organización comunitaria Make the road NY, en el el comité de inmigración llegando a ser parte del grupo de líderes del mismo, y donde desempeño un rol sobresaliente en la campaña de un ID para los habitantes de la ciudad de Nueva York. También ha sido miembro voluntario en otras organizaciones como ACQC, siento parte del el programa de latinos para la prevención del VIH, ahora como entrenador autorizado de OSHA promueve en los trabajadores y en la comunidad la importancia de tener un lugar de trabajo seguro y libre de riesgos. There has never been a better social and political climate for the cooperative to re-emerge as the most sustainable model of organizing enterprises. More importantly, the most humane model. As a former lawyer and social justice advocate, I see it as an opportunity to give life to social and economic human rights, long time neglected in the U.S. I see the Co-Op movement as an empowering force. As an entrepreneur, developing my own startup as a cooperative, meant that I’m committed to values of self-help, equality and, solidarity, in life and in business. I care about co-ops and bicycles quite a lot. One of my favorite writers said about bicycles – “It’s an invention that was in many ways ahead of its time, and whose time has finally come.” I think the same way about cooperatives. I would be thrilled to be a part of the leadership program; to be present with everything I can bring to the table and, to learn. Nunca ha habido un mejor clima social y político para que vuelva a surgir el modelo cooperativista, como el modelo más sostenible para la organización de empresas. Como ex abogada y defensora de la justicia social, lo veo como una oportunidad para dar vida a los derechos humanos, sociales y económicos en los EE.UU. Veo el movimiento Co-Op como una fuerza poderosa. Como empresaria, el desarrollo de mi propia empresa como una cooperativa, significaba que yo estoy comprometida con los valores de la ayuda mutua, la igualdad y la solidaridad, en la vida y en los negocios. Me importa cooperativas y bicicletas bastante. Uno de mis escritores favoritos tiene una famosa cita sobre las bicicletas – “Es un invento que en muchos sentidos estaba adelante de su tiempo, y cuyo tiempo ha llegado finalmente.” Creo que lo mismo de puede decir entorno a las cooperativas. Estaría encantada de formar parte del programa de liderazgo; estar presente con todo lo que pueda llevar a la mesa y, para aprender. I was born in Queens and am a life long New York resident. I was a director of educational opportunity programs for 15 years in three universities and a manager in building maintenance and pest control for 25 years. One of the observations I have made about the work world which elicits my anger is “qualification inflation”. It is more pronounced in some fields than others but it is often true that an academic degree is taken as proof that an applicant is more qualified for an entry position than an applicant without a degree. Such practices frequently eliminate immigrants and people of color from jobs that they are competent to hold while allowing management to appear to be fair and impartial. I think cooperatives stand a better chance of avoiding this pitfall. In a capitalist, consumer society such as we have in the United States, the worker-owned cooperative offers the best opportunity for those who labor to create company profits to receive compensation that is commensurate with the efforts they put forth to bring about wealth. That is why I am committed to supporting worker cooperatives. Nací en Queens y residente de Nueva York de toda la vida. Fui director de programas de oportunidades educativas durante 15 años en tres universidades y un gerente de mantenimiento de edificios y control de plagas durante 25 años. En una sociedad capitalista de consumo como la que tenemos en los Estados Unidos, la cooperativas de trabajadores ofrecen la mejor oportunidad para los trabajadores puedan recibir beneficios de las empresas en que trabajan, una compensación que es compatible con los esfuerzos que invierten en la misma. Es por eso que estoy comprometido con el apoyo a las cooperativas de trabajo. I’m from Puebla, Mexico. I have 10 years living in New York. Since I arrived, I started to work in domestic cleaning. It has not been easy, but every day I want to overcome adversities and improve my life. I’ve grown a lot working with our cooperative Ecomundo cleaning. My participation in the cooperative has been rewarding both personally and professionally. As co-founder of Ecomundo, it is very satisfying to see our cooperative continue to grow. In my country of origin, I was a union leader at the company where he worked, which was a Volks-Wagon factory. I was the secretary of the union, where I mediated conflicts and advocated for workers rights. I want to learn more about cooperatives in the city and represent Ecomundo in the coalition. Soy de Puebla, Mexico. Tengo 10 años viviendo en New York. Desde que yo llegue, comence a trabajar en limpieza domestica. No ha sido facil, pero cada dia tengo ganas a superarme y mi vida se ha mejorado. Yo he crecido mucho trabajando con la cooperativa Ecomundo. Me ha brindado muchas cosas en la vida, a nivel personal y profesional. Como fundadora de Ecomundo, es mi gran satisfaccion que cada dia mi cooperativa crece más. En mi pais era lider sindical en la empresa donde trabajaba ,que fue una fabrica de Volks-Wagon. You era la secretaria del sindicato y manejaba conflictos y abogaba por los derechos de los trabajadores. Quiero aprender más sobre las cooperativas y prepararme mas y traer mas informacion a mi cooperativa y representar a Ecomundo en la Coalicion.